Just a quick update today, as I’ve successfully connected my Amiga 1200 to the Internet. Woo hoo! 🙂 I’m very happy now and look forward to do some exploring. If some of you have some tips for optimizing my Workbench installation and my system in general, I’d be very grateful. Every KB of memory saved will aid in my quest to do stuff Online with 2MB of RAM. 😉 Is there perhaps an edition of Miami for low-spec machines? I’m also on the lookout for small, non-memory hungry utilities for the Internet. AMosaic, for example, is a browser I really like to get my hands on. Thanks in advance for your help. That is something I overlooked also that you need memory. My extra memory (phew!) at least works fine so I can use it without any issues. Still need to put it to the test with browsing. Congratulations for getting your Amiga A1200 online, I can imagine you’re probably quite excited at the potential access to resources; although as you’ve stated only having 2mb reflects the limitations of that experience somewhat. I have managed an A500 with 1mb online and would say it does become tedious, getting back to basics with using AmigaDOS environment, it’s a struggle to find those applications which compliment. ALynx and AMosiac are viable options though very dated. Run MiamiDX with no GUI. No Workbench, basic screenmode/colours. Very stripped down startup/user scripts. To be honest you end up regressing the AmigaOS environment when you’re trying to promote it – finding yourself in a catch 22. Couple of snapshots of my A1200 downloading ADF PDs from Magix FTP and converting to floppy for the OCS Amiga A500. I’m happy that it worked out well. It’s nice to have the machine Online. It opens up a lot of possibilities. Awesome to have access to so much software. I agree with you concerning the regressing part. Most probably I’l upgrade the Amiga 1200 again with a new turbo-card. I’m used to having Fast-RAM available and to suddenly loose it is a bit of a pain. 😉 Needless to say, I’m looking to see if something pops up at AmiBay. Well you’ve done the ground work – perhaps put a wanted ad in at Amibay at some point or maybe consider one of those new ACA budget accelerators and a PSU grade from Amigakit. Another alternative is fit the Fast RAM in the PCMCIA slot and run your network via PPP/PPPoE or pick up a serial modem and use a free/cheapy dialup solution – slightly round the bush but gets there. I have only been online with my A4000 (which has a lot more ram), but I used AmiTCP. I never really understood Miami, and found the AmiTCP config files to be more straight forward and familiar. However, I never used it much for web browsing. Nowadays I find that the classic Amiga is more comfortable to use for FTP, IRC and less graphic intensive protocols. Well done with getting it online, so after one month online hows it now going. Any more pics of it in action? Many thanks for commenting. 🙂 The machine is Online and works quite well. I’ve mainly used the connection for downloading files, but I’ve also tried other stuff. Stay tuned for more pictures. 😉 I’ll try to upload some soon! 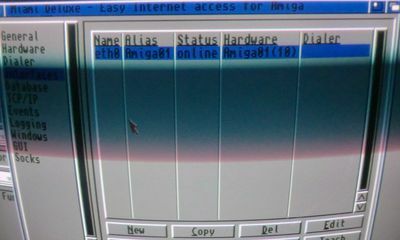 I’ve now taken some pictures of my Amiga 1200 being connected to the Internet. Hope you like the pictures. It’s not easy taking pictures of a CRT screen, due to all the flickering. I used to go online with my A1200, but that was in the early days (back in ’95-97), and all I had was a shoddy 28800 bps modem, hehe. Also, the Amiga wasn’t stock, but used a Blizzard 1230-IV card with 8 MB RAM. I still have it, but the harddrive died and it’s been sitting unused since then. I really need to breathe some life back into that computer. Hope you’ll get your Amiga up and running again. 🙂 Please let me know how it goes!